In April 2018, the Province of Ontario adopted an inclusionary zoning regulation. The regulation allows the City to introduce planning requirements for the inclusion of affordable housing in new residential developments and represents a significant step forward in addressing Toronto’s affordable housing needs. Before City Council can consider an inclusionary zoning policy, City staff must complete required background work, including preparing a demographic and housing needs analysis, financial impact assessment, undertaking public consultations, and drafting Official Plan policies. City staff are preparing the background analysis required to implement inclusionary zoning and plan to hold public and stakeholder consultations on draft policies in the first half of 2019. City staff will bring forward an inclusionary zoning policy for City Council’s consideration following the consultations. If Council adopts an official plan amendment to allow inclusionary zoning, the Minister of Municipal Affairs and Housing must approve it before it can be implemented. 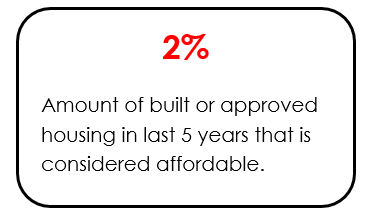 Despite the strong growth of new residential construction, there is not enough affordable housing in Toronto. The vacancy rate for purpose-built rental housing in Toronto (housing designed and built for long-term rental accommodation) is 1 percent, the lowest level in 16 years, and 0.7 percent for rented condominium units, according to the Canadian Housing and Mortgage Corporation (CMHC). The City has planning tools that protect the supply of rental housing and secure new affordable housing as part of site-specific applications and within Secondary Plan areas. For example, the City’s Official Plan policies encourage that when a developer seeks an increase in height and or density on a site larger than 5 hectares, the priority community benefit (known as a Section 37 benefit) requested by the City will be that 20 percent of the housing units approved as a result of the height or density increase will be affordable housing. The Central Waterfront Secondary Plan includes a similar provision for new development. The City also participates with other levels of governments to deliver new affordable rental and ownership homes through housing programs like the Toronto’s Open Door Program. The City had long requested the authority to implement inclusionary zoning to ensure affordable housing is a requirement of new developments and applied on a consistent basis rather than negotiated on a site-by-site basis. In April 2018, the Province of Ontario acted by adopting a regulation to allow municipalities in Ontario to develop inclusionary zoning policies. Many North American cities, including New York, San Francisco, Boston, and Vancouver have implemented inclusionary zoning with positive results. For example, after New York City adopted Mandatory Inclusionary Zoning in 2016, over 1,500 permanently affordable homes were approved in the first nine months of the program. set standards and procedures for the stewardship of affordable housing units to ensure long-term affordability. In January 2018, City Council adopted City staff recommendations requesting the Province of Ontario amend the proposed inclusionary zoning regulation so that it would provide the City with more flexibility to develop a made-in-Toronto approach to inclusionary zoning. The Province responded favourably to Council’s recommendations and in April 2018, adopted an inclusionary zoning regulation under the Planning Act. August 2016 City staff provided comments on the legislation and inclusionary zoning framework.